As you'll have seen, I've been thoroughly narcissistic on this blog. I've been gradually gathering photos from throughout my 44 years, and it's been interesting to see how the physique is different now from at any time in the past. I came across a couple of photos today which make scary viewing. I actually dug them out because I wanted to show my hairdresser the way my hair behaved when it was long: straight on top, but with bizarre curls underneath, and incredibly thick and heavy. I asked Emma how old she thought I was in this photo. "About thirteen?" she suggested. Actually, the yellow tie marks me out as being in the sixth form, and therefore at least seventeen. Zits, a round face and no sense of style. This one is even more worrying. 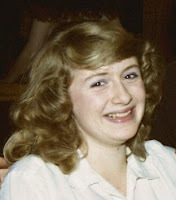 Taken during my first year or so at college, and hence round about nineteen years old; I know from diaries that I didn't weigh much over nine stone in those days, but just look at the round face. No cheekbones in evidence there.